Usha is a manager in the Knowledge & Insights Group of Intellecap, a social enterprise consulting firm based in Mumbai. She leads research efforts and analytical projects in the social enterprise and development space. She is on the editorial team for Searchlight South Asia, a monthly newsletter that Intellecap creates for the Rockefeller Foundation about urban poverty in Bangladesh, India and Pakistan. She enjoys reading and writing about innovations in the development sector. 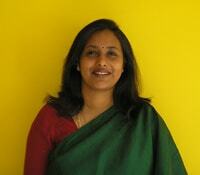 Usha has over 15 years of business research and content development experience in full-time and freelance engagements. Nearly 50 percent of India’s urban poor do not have access to clean toilets. With increasing migration to cities like Mumbai and Delhi, the pressure on public sanitation facilities has been immense. Shramik Sanitation Systems (3S), one of the early social enterprises that looked at sanitation in a holistic manner, provides community toilets in urban environments of India. SELCO, a social enterprise traditionally focused on providing solar energy to the rural underserved, has launched a new urban model in India that has helped electrify a set of slum-dwelling households in Bangalore. The early success has been less about the feat of solar power in slums, and more about creating a ripple effect for social impact. While mobile phones have increasingly become ubiquitous in developing countries, Bangladesh has taken the technology’s capabilities a step further. Many new initiatives have leveraged the sheer number of people using mobile phones: 76.4 million in Bangladesh. Neighboring countries have lagged behind in leveraging mobiles for development.